A while ago we posted an article on how venues are cracking down on the ubiquitous hospitality room at Indian weddings. The hospitality is one of those things that is needed at every Indian wedding, but it’s hard to swallow the additional costs associated with it. How much venues charge and their policies will depend on how busy the hotel is for your wedding date, the booking period and overall how much business you’re giving the venue. Some venues charge per person fees, others will waive them. But ALL venues will not allow you to bring in your own beverages. All beverages must be provided by the venue and they will charge for that. Some venues will allow you to bring in your own food from an outside caterer or even the grocery store. I’ve been to weddings that were across the spectrum – proper South Indian dosa and hot sambar, pastries from Costco, to samosas and finger foods to catered sandwiches from the local grocery store. 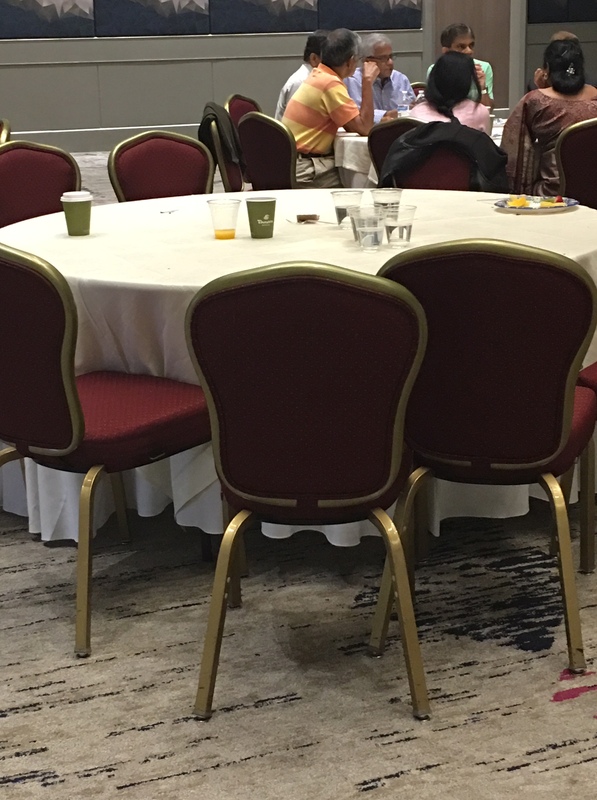 Venues really hate it when the hospitality room looks a mess – ie Costco lining the perimeter of the room. They believe it reflects poorly on them and deem it unhygienic. Understandably, the more revenue they get the more flexible they’ll be. And if they’re not likely to book another event on your scale, that same day, then that will impact flexibility as well. Some resorts and venues are in such high demand that they’ve instituted hospitality room policies that they don’t bend. For instance putting time restrictions on when the room is accessible and not allowing outside food. One thing we didn’t address in the previous article is what happens when the venue doesn’t service the hospitality room. Trash can pile up on the tables in the hospitality room and if you haven’t paid the hotel for labor to clean up, then ensure you’ve designated people who are going to do this. One reader shared that at a wedding he recently went to, the groom’s brother asked wedding guests to help him pick up the trash around the tables. Some guests were chill and happy to pitch in while others were visibly annoyed. Another reader shared that she went to a wedding and there was no one to replenish the food. It appeared that all of the vegetarian food was gone but it turned out there was a lot more stored in boxes underneath the buffet tables, hidden by the table linens, so none of the guests knew. If the costs for the hospitality room are adding up to be way too much, then have family and friends pitch in. Designate the responsibility to 1-2 reliable people. Let them know what food and beverage items were ordered. Where the food was catered from. How much there should be of each item. Amongst all the things you’re organizing for your wedding day this may seem like a tiny detail that doesn’t matter. And the thing is, this is one of those things that doesn’t seem like a big deal until you’re sitting in that room with tables full of trash or there’s no food left. This impacts your guest’s experience and in some cases it’s the first impression of the entire wedding weekend, so you want it to be a good one! The hospitality room at your venue is one of those things you need, but the costs can really add up. You can negotiate with your venue to bring in your own food while they supply the beverages. Every venue will vary on their policies around this and a lot will depend on how busy they are that weekend, the booking window and how much business your wedding is bringing in. If the costs are just adding up too much beyond your budget and the venue is just asking for too much, then designate 1-2 people to man the room for you – to remove trash from tables, replenish food items, and inform the venue staff when the trash bins are full. Previous Previous post: Is It Realistic to Repurpose Your Wedding Lehenga(s)?